The startup lets you grow produce year-round, right from the comfort of your own home. 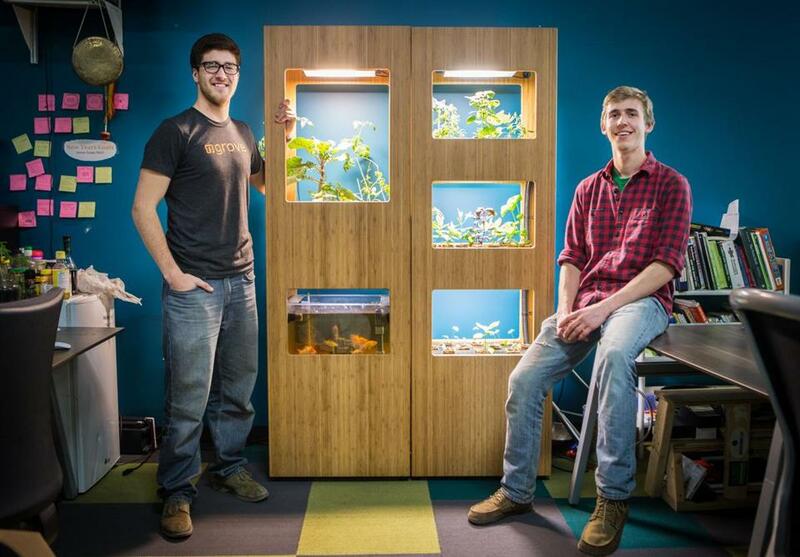 Grove Labs cofounders Gabe Blanchet (left) and Jamie Byron hope for big things from their aquaponics creation. Even when the sidewalks were icy and a chill hung in the air, it was toasty inside the testing space at Somerville eco-startup Grove Labs, where the air always smells of damp soil and sawdust. Bunches of romaine run riot, and ripe tomatoes weigh down their vines, all fertilized by goldfish and brook trout in nearby tanks and lit by smart LEDs designed to mimic the sun. This is the future of food dreamed up by twentysomethings Jamie Byron and Gabe Blanchet — an indoor garden the size of a bookcase, engineered to sustain offseason produce year-round. Byron, an aerospace engineering major, built his first aquaponics system in his MIT fraternity room. Within a month, a jungle of string beans, lettuce, kiwis, and some dozen other plants filled his bay window overlooking the Charles, fed on filtrate from a fish tank. “Fraternity brothers would come in, crack open a beer, pick a lettuce, and watch the fish — it became this lifestyle built around our grove,” Byron recalls. As if on cue, Blanchet reaches over, tears off a handful of kale from a nearby plot, and eats it. What began as a hobby eventually bloomed into a promising business. Byron and his former roommate Blanchet teamed up for a stint at MIT’s Global Founders’ Skills Accelerator. There, the two fine-tuned their idea of a high-tech indoor garden, with well-designed smart lighting and sensors to monitor the growing conditions within the system, all of which feed data into a smartphone app. Grove officially launched in fall 2013 and less than a year later picked up $2 million in seed money. Prototypes have successfully grown jalapenos, tomatoes, Thai basil, mizuna, and kale. Byron and Blanchet say that freshly harvested Grove-grown produce could eventually save you money and will taste better than store-bought greens because they’ve been harvested closer to dinner time. The wooden cabinets, supplied by a cabinetmaker in Clinton, are both compact and handsome enough to take up residence in the corner of your kitchen or living room. By the time the kids are old enough to own their own Grove, Byron and Blanchet hope they’ll be a household staple that goes beyond locavores. They’re also hoping that they’ll be able to sell at a lower cost. WOULD YOU GO FOR A GROVE? Need a house sitter? Nope. It can go up to two weeks unattended. Nidhi Subbaraman is a staff writer for BetaBoston. Send comments to magazine@globe.com.